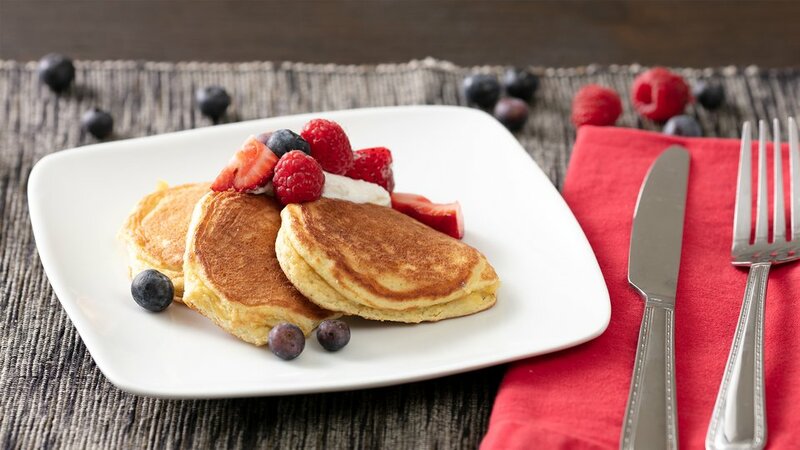 Coconut flour is a great low-carb baking option, perfect for this delicious twist on a breakfast favorite. This quick and easy breakfast a great go-to when you're in a cutting phase. For those times you're not as strict on your macros, you can add chopped nuts, frozen blueberries, or even chocolate chips. Separate egg, being careful not to get any yolk in the egg white. Set aside egg white. Combine egg yolk, oil, and coconut milk in a bowl. In a separate bowl, mix together dry ingredients, then add the dry ingredients to the egg mixture. Whip the egg white with a pinch of salt until stiff peaks form. Cook the pancakes in a pan or griddle on medium-high heat. Serve with fresh fruit and a small spoonful of sour cream.